Scrapbooks of news clippings, programs for athletic events, media guides for women’s teams, caps, buttons, photographs, Belle Air yearbooks, a letterman’s jacket and much more invite perusal. There is even a partially inflated football (courtesy of Roman Catholic High School) from a 1922 City Championship game between Villanova College and the High School. Villanova lost that contest, 9 to 13! 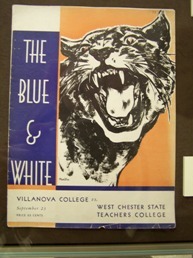 Although Special Collections sponsors the exhibit, considerable material comes from the University Archives. The University Archives reside in Falvey; the archivist is the Rev. Dennis Gallagher, OSA, PhD. Laura Bang installed the exhibit with assistance from Michael Foight, Special Collections and Digital Library coordinator. Joanne Quinn, Falvey’s design specialist, created the exhibit’s signs, including the banner on the library’s home page.